Virtual Reality – Can we make it so? You can see that while the participant is actually experiencing standing on Everest, the rest of us can see the view he is embedded within on the bigger TV screen. Perhaps the closest thing to a group VR experience right now! Apart from being able to try the Oculus Rift for the first time, and meet some really cool library gurus (Ellen Thompson and Sarah Howard, I’m looking at you! ), I was inspired to think more about VR, and its potential role in education. This post is a place-holder. I intend to follow it with more detailed posts in the new year, once I have the opportunity to learn more. I have written before about VR on this blog, and have previously delved into the world of AR (augmented reality) on the ResourceLink blog which I used to write when I worked for Brisbane Catholic Education. Before I left my role as Librarian, I had just put together a kit of 6 Google Cardboard viewers, with which I included documents outlining how to use the viewers and what apps might be suitable for students to begin exploring. I also began a Flipboard magazine, with interesting articles to read about the potentials of VR and AR in education. You can read it for yourself here. So with the 2017 K-12 Horizon Report suggesting that VR has only 2-3 years until it is widely adopted, and the Gartner Hype cycle positioning VR ahead of AR and just emerging from the Trough of Disillusionment, what does this mean for educators and for pedagogy which embeds this technology? The first step is of course to play and familiarise oneself with it, so that ideas for how they might lead to new pedagogical approaches might emerge. 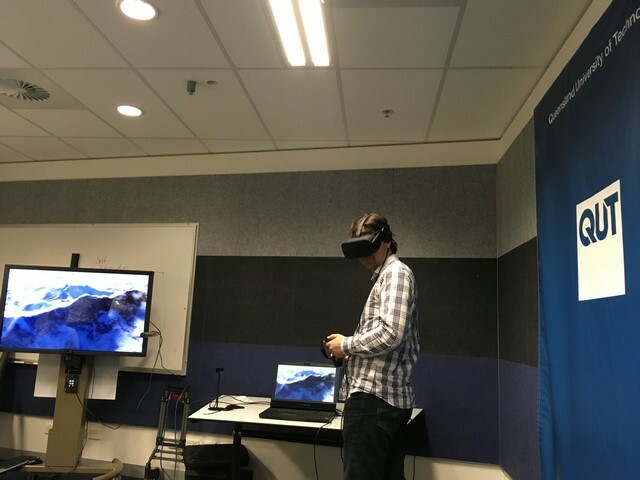 At this stage, most of us have never really had the chance to engage deeply with the experience of VR, so it is great to know that QUT is investing time and money into exploring the possibilities, and students and staff can contact the HiQ system to find out about borrowing these technologies to play with. I am hoping to get hold of one to spend more time in virtual reality, so that I can learn more and blog in more detail about the possibilities for education. I’m keen to connect with others who have similar interests, so if you use VR in your teaching, or have come across interesting or innovative ideas or resources, drop me a line! Maybe 2018 will be the year virtual reality becomes a real reality in classrooms. If you have plans to make it so, get in touch – I’d love to hear more! :).